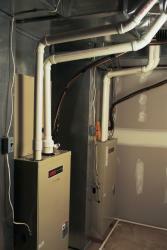 Are you in need of a Heating System Installation contractor? Living in Arizona, the necessity of a good heating system can often be overlooked as the focus is often on how hot it gets. However, the winters can still get pretty chilly. And when it does get cold, you’re going to want to be able to stay warm, both at work or at home. So, whether you just need to update your current heating system or install a heating system for the first time to make your home feel more comfortable, Ocean Air is here to make it happen. Ocean Air has been in business since 2001. Throughout all of the years that we’ve been serving the greater East Valley, our heating contractors have been helping clients increase the enjoyment of their homes and business by installing top-of-the-line heating systems (such as Rheem brand equipment). The air flow has decreased? The heater repeatedly turns off and on? You’re noticing uneven temperatures throughout the home? If you answered yes to one or more of those questions or are experiencing any other issues with your heating, it’s time to give Ocean Air a call! We’ll be happy to come out and provide an assessment of your heating system and discuss repair, replacement, or first-time installation options. If you are needing a new heating system (or are installing one for the first time), our heating contractors will discuss the best options with you so that you can make an informed decision about equipment that will be both efficient and cost-effective. Ready for better heating? Give Ocean Air a call today at 480-358-9435 or head over to fill out the form on our contact page, and we will be in touch shortly!